If you have a phone or video interview coming up, complete this web form at least 2 business days in advance of your interview and a member of our staff will get back to you with within 48 hours. Please note during high volume time periods (September through November) we will do our best to find space, but due to space restrictions may not be able to accommodate all requests. When are interview rooms available? Interview rooms are available Monday through Friday 9am-5pm*. Please note the last appointment of the day must start by 4pm. *Please note during high volume time periods (September through November) we will do our best to accommodate all requests, but due to space restrictions may not be able to accommodate. 2. Can I reserve more than one interview room at one time? No. In order to accommodate as many requests as possible, you can only reserve one room at a time. Once you’ve completed an interview, you’re welcome to submit another request. 3. Do you have a phone or computer I can use for my interview? Yes, however, we have a limited number of landline phones and computers with webcams, we will do our best to accommodate all requests. 4. How long can I reserve a room? Each reservation is for 1 hour, if you need extended time please make note in the comments section of the form. 5. I don’t need the interview room anymore; what should I do? If you make a reservation, but decide you no longer need the space, you must cancel your request at least 24 hours in advance. Failure to do so means that another student who may have wanted the space is unable to use it. To cancel your reservation, please call (212) 854-9167 or email cce@columbia.edu. 6. I need to use an interview room today; what should I do? You should complete the online form, and then call CCE at 212-854-9167 to explain your situation. We will do our best to accommodate your day of request, but cannot guarantee availability on short notice. Your reservations are not considered final until you receive a confirmation email from CCE. 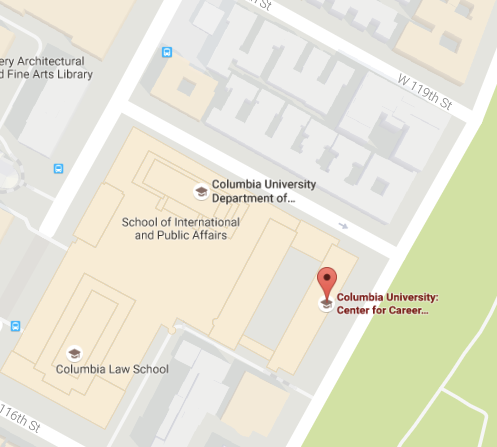 When you cancel a reservation with insufficient time for another student to request that time and space, you adversely affect other Columbia students’ opportunities to utilize the Interview rooms. This is especially important during busy times at CCE. All cancellations must be communicated 24 hours in advance via email to cce@columbia.edu.